Brian Graham netted four goals for Ross County. Ross County eased to a 5-0 win over Raith Rovers in the IRN-BRU Cup, with Brian Graham netting four times against his former club. All of Graham’s goals, along with Jamie Lindsay’s header, came during a first half in which County tore apart the League 1 side, who had Kevin Cuthbert in temporary charge following the resignation of Barry Smith. The result safely secures County’s place in the third round of the competition, which takes place next month. County made five changes from the side that defeated Falkirk 2-0 the previous weekend, with Ross Munro, Sean Kelly, Jamie Lindsay, Stelios Demetriou and Davis Keillor-Dunn drafted in to replace Scott Fox, Michael Gardyne, Iain Vigurs, Don Cowie and Keith Watson. Raith had the best chance of the opening stages, with Lewis Vaughan clipping the top of the crossbar with a free kick after just three minutes. The Staggies gradually stepped up their threat however, with Kelly, Josh Mullin and Billy Mckay off target with efforts. County were in control though, and it was no surprise when they took the lead on 18 minutes, with Graham on hand to direct Mullin’s cross home at the near post. 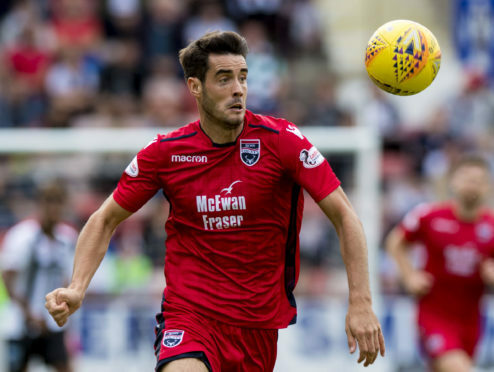 The Staggies doubled their advantage just 10 minutes later, with Graham on hand to bundle home from point blank range after Liam Fontaine had seen his header fumbled by goalkeeper Kieran Wright following Mullin’s corner. The home side netted a third on 36 minutes, with Graham denied his hat-trick by the width of the post, however Keillor-Dunn quickly returned the ball into the middle for Lindsay to nod home. Graham’s treble did arrive five minutes before the break however, when he was on hand to nod home Mullin’s corner, before he netted with another header from a Demetriou cross just two minutes later to bring County’s half time tally to five. The Staggies had further chances to extend their lead after the break, with Billy Mckay and Liam Fontaine both coming close, however their passage had long been secured.